Today is grey and rainy, but it’s nothing but Spring here on my couch as I look forward to the epitome of celebrating life and beauty – Easter! It’s got to be one of my very favorite holidays – the vibrant colors, the promise of flowers and sunshine and – let’s be honest – baskets of candy. 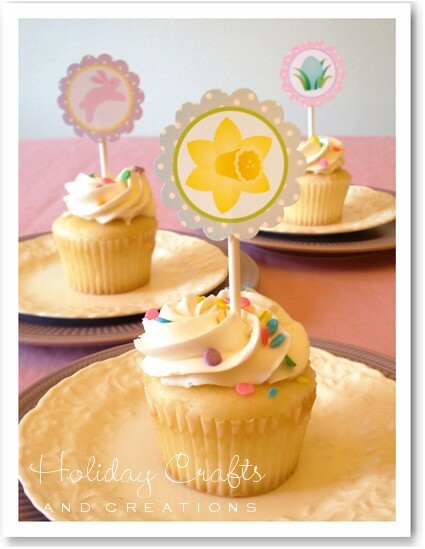 As I am doing my Easter-treat planning, I came across these super easy, absolutely adorable and free printable decoration for an easy dessert here and had to share! I can’t wait to use these in a couple of weeks and thought they could double – sans lollipop sticks – as gift tags or even a cute napkin ring with a colorful ribbon threaded through holes punched in the cardstock. I hope that you are enjoying the Spring transformation outside of your window and that we’ll soon see blooming flowers – until then, we can make our own! Thanks! I thought these were adorable – loved using them!